The international discussion about the conservation of water resources and more target-oriented poverty-alleviation strategies creates a favourable environment for new sanitation approaches and innovative wastewater treatment solutions. 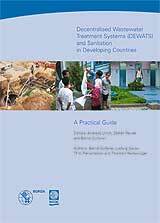 In many countries, a rapidly upcoming demand for decentralised wastewater treatment systems (DEWATS) and a demand for efficient community-based sanitation (CBS) can be observed. DEWATS is designed to be an element of a comprehensive strategy for city-wide planning and sustainable infrastructure development. In this book, not only are the technical requirements for the efficient treatment of wastewater at a given location explained, but the specific socio-economic conditions and steps for community action planning are also taken into consideration. This book is essential reading for urban service providers (utility managers and employees, governments, regulators, and advisers, urban planners, private sector); national and local government (especially those working with the delivery of urban services); bodies of international co-operation and technical assistance; academic institutions; international NGOs; professional bodies; and local community-based organizations (customer groups, NGOs, CBOs).